The exterior color was called Red Rock Metallic, the interior was Jet Black. It was a gorgeous pickup which I put to the test during a week-long test-drive. It was the new 2016 Chevy Colorado 4WD mid-size pickup, with a crew-cab configuration and a short box bed. As full-size pickups have seemed to get bigger and bigger, many consumers are once again looking at the mid-size segment of pickup trucks. Chevrolet introduced their redesigned Colorado a few years ago and its popularity is evident by their sales numbers. It meets the needs of many drivers who do not require a larger truck, and want the versatility of a smaller pickup. The 2016 Chevy Colorado 4WD I test drove was powered by a 2.8-liter Duramax, 4-cylinder, Turbo-diesel which was matched with a six-speed automatic transmission. Sure, there was a minor ‘rumble’ that indicated it was a diesel under the hood, but the performance was excellent. It has been a long time since a diesel engine has been available in a mid-size pickup, so the GM engineers really worked hard to ensure its performance. My impression is that they hit the nail on the head. The minor sound or ‘rumble’ is mostly due to the Colorado not having a muffler, which is not required within the guidelines for noise. The truck was outfitted for towing and hauling, including a smart-diesel exhaust brake system that provided more control and a lot less brake wear on steep grades. There was also an all-new integrated trailer brake controller that comes as standard equipment on the Colorado diesel model. Noticeable features on the Colorado, which are not necessarily considered new or unique, were the ‘Corner-Step’ rear bumper, the EZ Lift-N-Lower tailgate, thirteen standard tie-down locations in the bed, four USB ports, a factory-installed spray-in bed-liner, six airbags, very large rearview mirrors, and a really good backup camera system. The MSRP of the test-drive model was shown as $34,640. The turbo-diesel engine added $3905 and the ‘assist-step’ side rails added $745. Those side rails were very handy and appreciated by a lot of buyers of pickup trucks because it makes getting in and out so much easier. A few other options along with the destination charges bumped up the final sticker price to $41,905. This was not a full-size pickup but a mid-size model, although it was outfitted with so many extras that it justified the price. 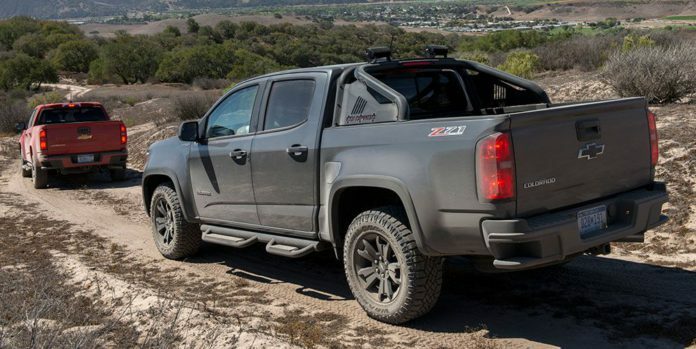 The 2016 Chevrolet Colorado 4WD diesel was EPA rated for an average of 23 mpg and 29 mpg highway. During the week, the truck was used in four-wheel drive conditions, for minor towing and hauling, and we spent half the time on the highway. The week concluded with an overall average of 27.6 mpg, which was a pleasant surprise. The 2016 Chevy Colorado 4WD definitely fills the need for those drivers that need a pickup that is not too large. It is a great alternative to a full-size pickup, is easy to drive, very versatile, and provides capability and convenience for many consumers.